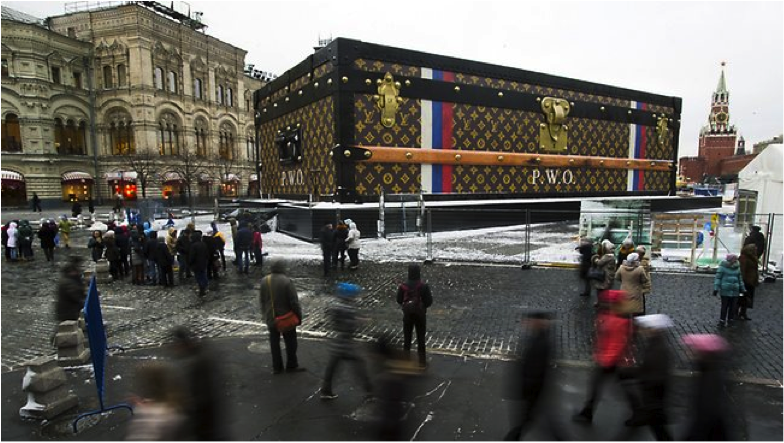 IIN NOVEMBER OF 2013 Louis Vuitton raised an epic suitcase-shaped pavilion in Moscow’s Red Square to celebrate and promote the history of the brand. The project was ambitious, but ultimately controversial and arguably an unsuccessful one since after just ten days the brand was ordered to dismantle the structure by local officials due to its size and positioning in the square.1 At 30m by 9m, the suitcase was seen to be overshadowing the view of St. Basil’s cathedral and Lenin’s mausoleum within the square. Plans for the structure, which was to house the exhibition of the brand’s history over the coming months have too, been dismantled. This is not the first time the luxury brand has dominated the streetscape with their site-specific monument branding; large-sized suitcases in the trademark ‘LV’ monogram began appearing on the Champs-Élysées‎ in Paris and have spread across Europe to Asia on the occasion of various openings, anniversaries and store renovations.2 In this case, and those of other brands, such as Prada, Dior and Tiffany & Co., these are immersive and engaging monuments in the brand’s name that go beyond the internal and exclusive confines of a retail or gallery space. 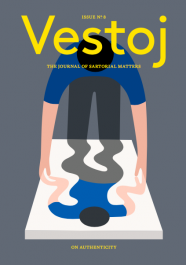 Their exposure to the public in the city context, and their accessibility on the street-scape, is key to generating publicity for the company, reinforcing their status as a global brand. 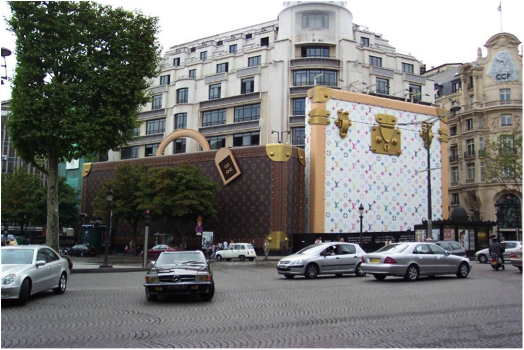 These spectacular monuments reflect a luxury brand’s identity in a way that reinforces the perceived values created to sell the product; the giant suitcase is literally an icon for Louis Vuitton in the same way that the cultural art pavilion, ‘Prada Transformer’ designed by Rem Koolhaas in 2009,3 is for the Prada Group. 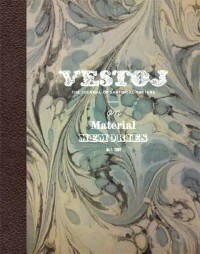 Each of these presents a magnified and symbolic vision for the brand – powerful advertising in other words. For Prada the affiliation with Koolhaus’ design notation, and the intention of the monument as having an art and cultural focus, is key to furthering the image of the brand as intellectual and design-conscious. 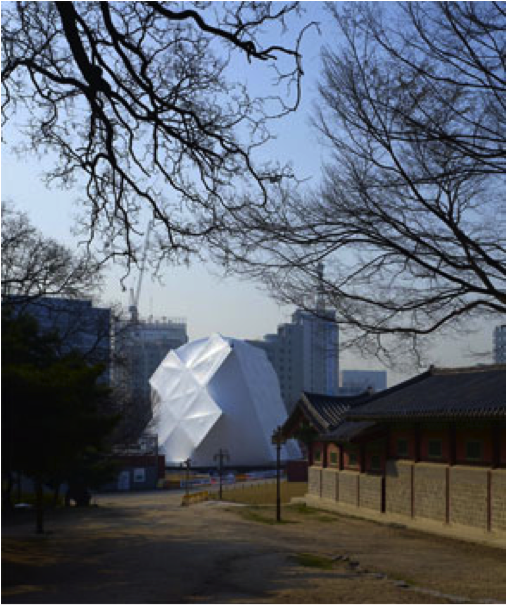 The location of these public installations is also important in offering an iconic context for them to be viewed in. 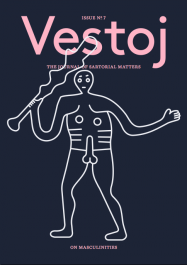 These strategies incorporate the functions of public art, and, more often than not, engage with the vernacular or artists like Jeff Koons and Claes Oldenberg who in their installations rely on similar factors of place, public exposure and spectacle. Most often these objects are carefully placed in iconic tourist areas, or busy retail pathways. As well as having high traffic and visibility, this helps to reinforce the image of the brand with the iconography of the place itself; recent examples include, for instance, the Vuitton suitcase on the Champs-Élysées‎ and the Tiffany box in New York’s Rockefeller Center. The city is an important element here as the locations are deliberately linked with the fashion company, and reinforce that these are global companies. This also connects with the themes of travel inherent in the marketing of these brands, like Louis Vuitton, Hermes and Longchamp that maintain this as a vital component in the image of their brand. 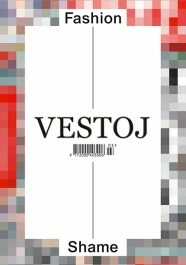 The public exposure of these luxury structures is a strategy that represents a shift in focus for luxury brands, to promote outward to the public instead of the closed off exclusivity that is historical of high fashion brands. Moreover there is a level of public engagement required of these high fashion street monuments that goes beyond the fashion image of a billboard, as a spectacle that engages as a tourist destination and an iconic spectacle for the beholder but also as a finely-tuned, large-scale branding strategy. 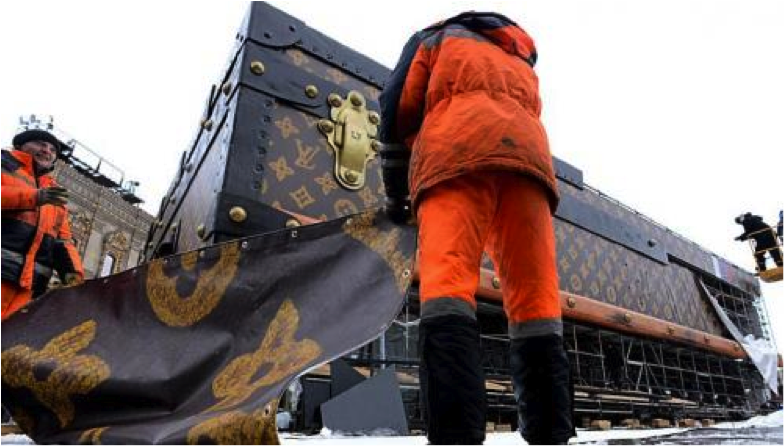 The Louis Vuitton suitcase in place in Moscow’s Red Square prior to being dismantled, 2013. The suitcase is dismantled from Red Square, Moscow, 2013. Giant monogram Takashi Murakami monogram luggage’s erected on Louis Vuitton’s Champs-Élysées store for their 150-year anniversary in 2004. 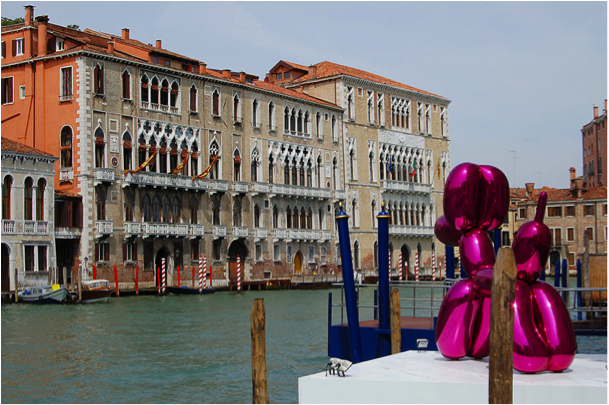 Jeff Koons’ magenta ‘Balloon Dog’ positioned on the Grand Canal in Venice, Italy, 2006. 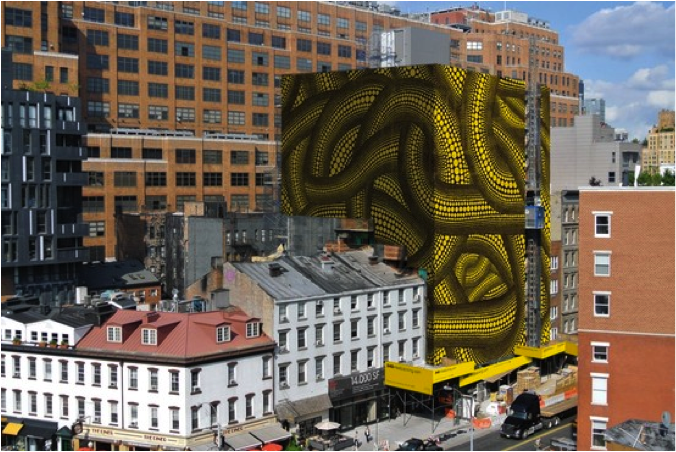 Yayoi Kusama for Louis Vuitton temporary façade during the construction of their New York store in the Meatpacking district, 2012. 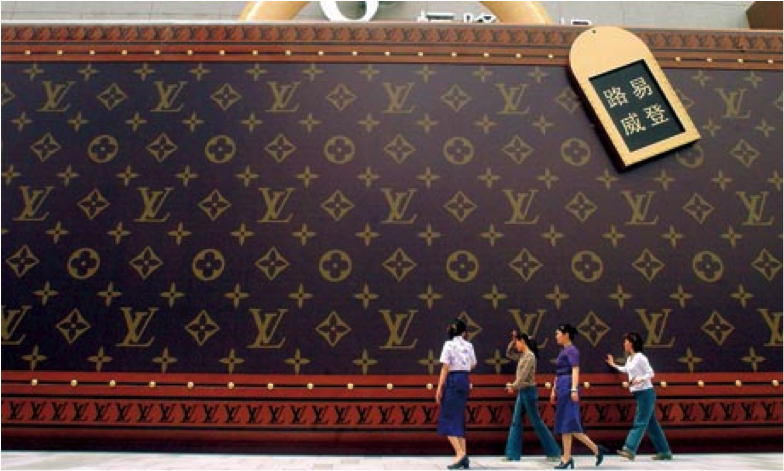 A Louis Vuitton suitcase appeared in 2004 in Shanghai, China on the occasion of the brand’s 150 year anniversary. 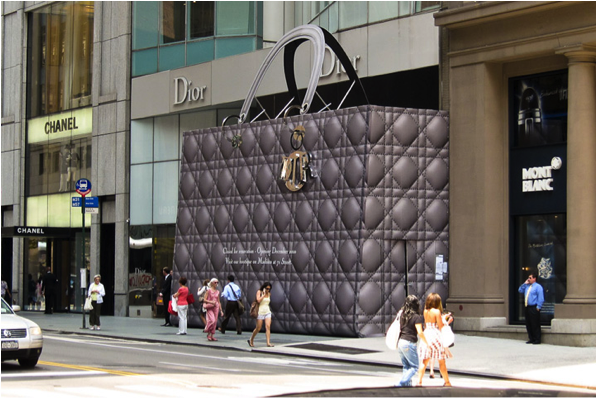 Dior’s giant purse, built to conceal the construction of their East 57th Street store in New York in 2011. 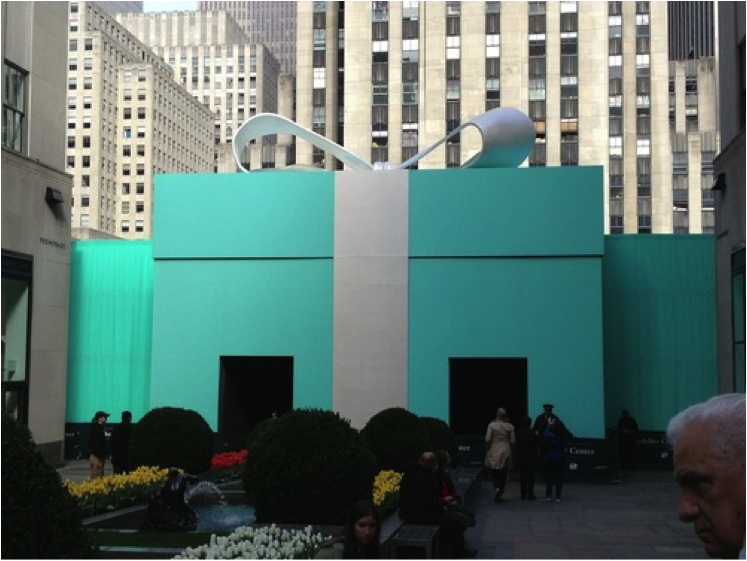 Tiffany & Co.’s iconic giant blue box set up in the Rockefeller Center complex for a display for the film, ‘The Great Gatsby’ in 2013. 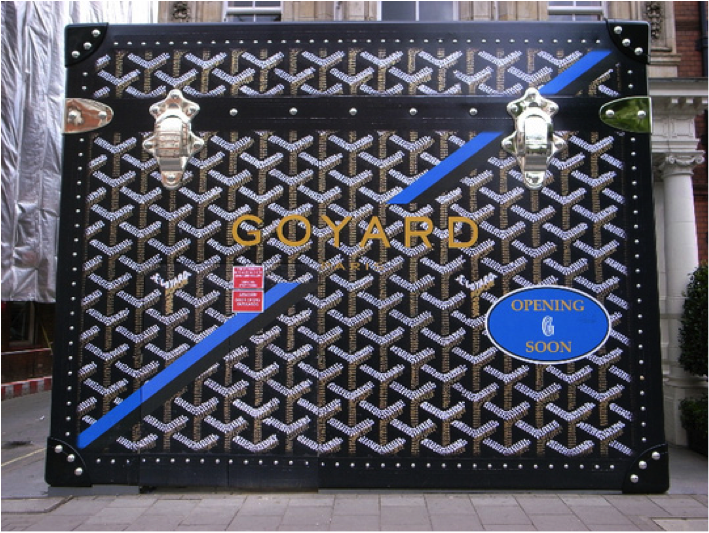 The façade of the Goyard London flagship store during its construction in 2009. 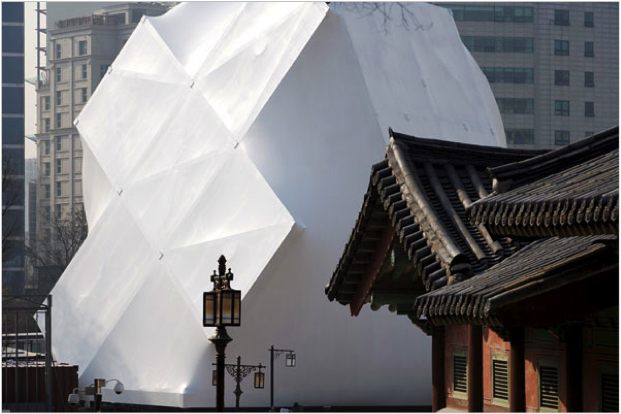 The Prada Transformer an evolving and changeable structure that functions as a cultural pavilion and art space, designed by Rem Koolhaas in 2009 first set up in the courtyard of Kyeonghee Palace, Seoul, Korea. 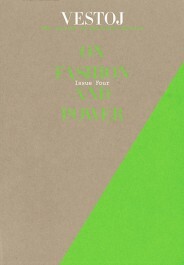 Fashion’s love affair with architecture is, at least at face value, an aspirational one, the academic tendencies of architectural discourse lend authenticity to fashion, which is traditionally perceived as trivial, and changeable in contrast to the sheer solidity of an architectural structure. Filmed between 1966 and 1980 by the self-proclaimed Magus of cinema, Kenneth Anger, Lucifer Rising is Anger’s portrait of the love generation, the dawning of a new age and morality. 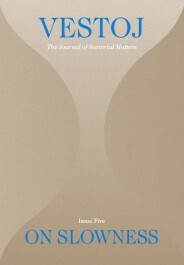 Continuing on from his previous works where fashion becomes a tool of power to conjure a magical sense of being, an invisible and volatile force, Lucifer Rising furthers this exploration crossing through millennia and civilisations. 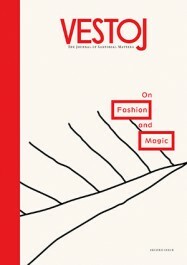 The Fashion Cycle, or Trend Cycle, helps us trace a garment’s journey from ‘in’ to ‘out’ of fashion. 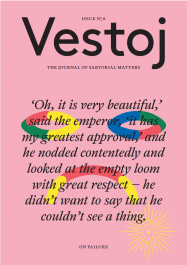 It’s a idea most would be familiar with, even those who don’t maintain a particular interest in fashion, since it presents a framework for looking at the economics of the fashion system as a whole, encompassing high to low.